India’s holiest city is also one of its most fascinating. Varanasi is one of the oldest continually inhabited cities in the world, which alone makes it a must-visit destination. The beating heart of the city, the River Ganges, is where you’ll likely want to spend a good chunk of your time taking in the awe-inspiring spiritual traditions performed there day and night. In addition, the many temples, markets, and other spiritual sites will keep you busy. If you’re planning a visit, check out our guide to everything you need to know about getting around, what to do, and what to see to maximise your adventure. The easiest way to get to and from the airport in Varanasi is to take a pre-paid taxi. You can find the taxi booth in the arrivals hall and a trip will usually cost between INR 500 and 800 depending on where you’re travelling. Much of what you’ll want to see in Varanasi, in particular the waterfront and the ghats, are best explored on foot. Many of the city’s ancient, winding streets are also too narrow for taxis or even autorickshaws so you’ll need foot power for those as well. If you’re going elsewhere you can easily flag down a cycle rickshaw or autorickshaw. A short journey in a cycle rickshaw should run you between INR 40 and 70. For an autorickshaw you can expect to pay anywhere from INR 60 to 200, depending on where you’re going. You can find autorickshaws outside Varanasi junction train station, but otherwise they’re fairly easy to flag down. Be prepared to haggle over the price in both cases and agree on one before you get in. Spending time along the Ganges is a huge part of any visit to Varanasi. Hindus believe that taking a dip in the holy waters will offer salvation of sins accumulated in current or previous lives, thereby purifying the soul. A sunrise and sunset boat ride on the Ganges is a great way to experience the importance of the river and the ride will also allow you to see all of the major ghats (steps that lead down to the river). Rides usually go between Dashashwamedh Ghat to Harishchandra Ghat. Whether you’ve taken a boat ride along the ghats or not, it’s also worth exploring on foot. Out of all the ghats, Dashashwamedh Ghat is the most popular. Anyone interested in learning more about Buddhism should take a short trip outside of Varanasi to Sarnath. Located about 12 kilometres outside of the holy city, Sarnath is the place where Buddha gave his first sermon after achieving enlightenment, and one of the four important places in the life of Buddha that also include the site of his birth, death, and enlightenment. Varanasi is also home to numerous temples, the most popular being the Kashi Vishwanath Temple, which is dedicated to Lord Shiva. The golden-domed Hindu temple is one of the world’s most visited sacred sites so be prepared to jostle among crowds and wait in potentially long queues, but for many, any time spent in a line is worth it to visit one of the holiest sites in the city. Taking in the daily 45-minute evening Ganga aarti ceremony ritual is a once-in-a-lifetime experience in Varanasi. Best viewed from the Dashaswamedh Ghat, the elaborate ceremony is performed in three holy cities on the River Ganges, including Haridwar and Rishikesh in addition to Varanasi. It’s best to arrive by 5pm or 5:30pm to get a good spot, and the ceremony begins at 7pm in the winter and 6pm in the summer. A group of young Hindu priests perform the highly choreographed ritual on an elevated stage facing the Ganges. Clouds of incense fill the air, while priests chant and circle large flaming lamps in praise of the river, which is seen as a goddess. Sometimes, getting lost is the best way to get a feel for a new city and Varanasi’s twisting maze of ancient alleys were made for aimless wandering. You never know what you might stumble across: a cow ambling towards you, a sizzling street food cart, a shrine, a temple, a café, or maybe a guesthouse. No matter which way you turn you’re likely in for a surprise of some kind so keep your camera ready. 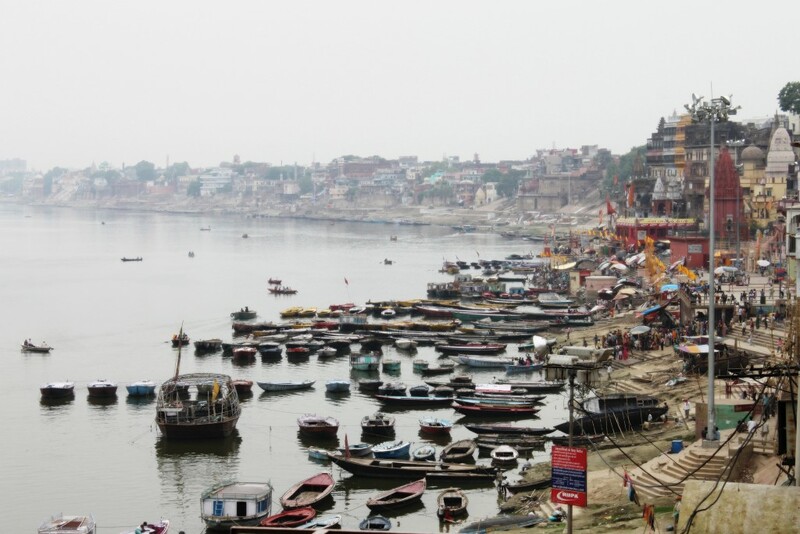 The Ganga River (or Ganges) runs through the veins of Varanasi (Banaras). Even locals regularly call out har-har Gange, meaning “long live Ganga,” and, come evening, locals flock to the ghats to release lanterns and flowers into the water. Follow Varanasi’s veins straight to her heart on this spiritual tour of an ancient city. Greet the day on this cultural wake-up call in Varanasi! You’re getting up bright and early to get up close and personal with some of the most sacred traditions in India. Cleanse your Karma with a fire god ritual, witness traditional Indian mud wrestling, sail a boat down the cherished Ganges, and see the city’s spiritual side awaken before the sun comes up. Raanjhanaa, about a boy who needs to break his class restraints for love, Masaan, about four separate lives intersecting on the Ganges, and Water, about a group of widows in 1938 India, are a few of the movies to watch to get you in the mood for Varanasi. Bismillah Khan (Shehnai), Birju Maharaj (Kathak dancer), and Ravi Shankar (Sitar Player) are some of the musicians born and brought up in Varanasi. Get ready for a trip to Varanasi by pocking up a copy of Diana Eck’s Banaras, City of Light. The book combines the spiritual and historical aspects of the city. To find out more about Varanasi or to book an Urban Adventures tour, email us at info@varanasiurbanadventures.com. You can also follow us on Instagram for live updates from the city. Take a tour through one of the world’s oldest living cities, and along one of the world’s most revered rivers. You’ll follow the path of the famous Ganges (or Ganga River) on this evening walking tour.